Champion Old Iron Boomerang is the fourth generation of Oldiron ROYAL SHOW BEST IN GROUP winning sires. (Champions OI Bommerang, Grange Hermitage, Thorpedo and Just Awesome). Boomer won Best Puppy in Show at Sydney Royal and bettered the win with Puppy in Show and Best Terrier at Melbourne Royal. Boomer won his first Best in Show at the Sydney Airedale Club and went on to Puppy in Show and Best in Show Third at Great Joint Terrier. He did all this with the help of Junior handlers, especially Emily Marshall , who regularly showed him. Boomer had a break after the Victorian bush fires. He returned to Sydney this year to again win the Airedale show going on to Best In Show at Great Joint Terrier. He recently won Best in Show at the South Australian Terrier Club and Best Airedale and Third in the Terrier Group at Adelaide Royal Show. boomer won Best Airedale at Melbourne Royal Show this year. 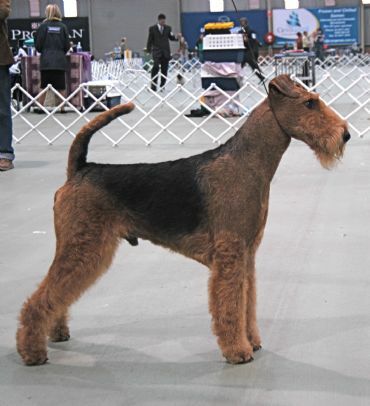 He now has four Airedale Show Best in Shows, his latest under Inge Neilson from Sweden. Boomerangs do come back!